A little dish goes a long way with this decadent side dish. Serve it alongside beef as a Surf & Turf or feature it as the entree with a big salad for a lighter meal. Makes 10-12 ramekins. 4 ears fresh sweet corn, lightly steamed in husks (I do this in the oven or microwave,) shucked, rinsed and cut from cobb, harvesting as much corn and corn “milk” as possible. Preheat the oven to 325°. In a medium saucepan, simmer the cream over medium heat until the surface begins to shimmer. Set a teapot of water on to boil. In a large heatproof bowl, whisk the egg yolks until well blended and they just start to lighten in color. Slowly add the hot cream mixture, whisking continually. Stir in salt and Old Bay. Arrange ramekins in a roasting pan. Coat with non-stick spray. Fill with corn and crab. Slowly pour the custard over top. Set the roasting pan in the center of the oven and carefully pour in enough hot water to reach halfway up the sides of the ramekins. Bake for 22-25 minutes, or until the custard is firm at the edges, but still trembling in the center. Transfer the pan to a wire rack to cool. Remove ramekins, drain off water from pan then return dishes to roasting pan. Can be made to this point up to one day ahead: cover and refrigerate; before serving re-heat the chilled custards in 350° oven for 15-18 minutes, then proceed with sugar crust directions below. Just before serving, preheat the broiler to high. 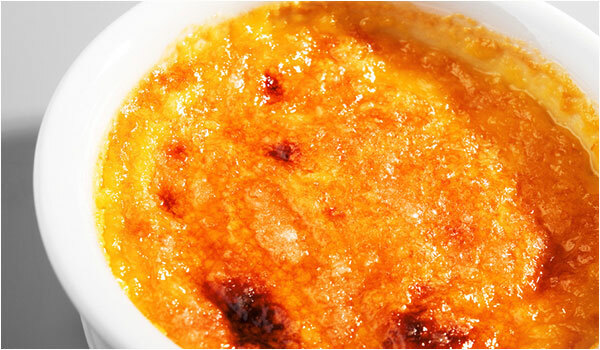 Spread sugar over custards in a thin, even layer. Set baking sheet with ramekins in oven and broil the custards as close to the heat as possible until the sugar is evenly caramelized, 30 seconds to 2 minutes, turning the pan to ensure even browning. Or use a kitchen torch to melt the sugar and form a crispy top. Let cool apx 5 minutes before serving. *Can be made with lobster instead of crab! I take large pieces of cooked lobster claw and simmer them in the cream to add additional flavor, removing shells and scraping out any cream before adding cream to yolks.